eurgh, this is so gross. why did shadowclan have to live here out of all places? starclan, is that a plant or a severed rat's tail? 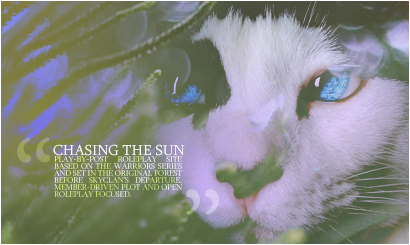 with this starclan-awful lighting, the forest may never know. lynxchaser wrinkled his salmon-colored nose in disgust, swallowing down the bile rising threateningly in his throat. vomiting now would only add to the horrid decor of the boggy marsh he was currently attempting to wade through, and it was already not a pretty sight to see. the pads of his paws were slimy and squelched disgustingly with every tentative step the tom took. dried and decaying pieces of foliage clung to striped legs. thinking of thunderclan's and skyclan's sprawling, lush, clean territory, lynxchaser was green with envy. he cringed at the sanity the founders of his clan seemed to have had back then in thinking that the deep, dark marshes on this side of the woods would make a good home. scampering onto the most solid patch of ground he could find, lynxchaser set to shake the mud and murky water out of his pelt. “i just groomed it, too. oh, the things i do for rosestar and this clan. i should get an award and my own personal den and assistant.” the very least he could do, however, was look presentable for his apprentice on their training day; he could worry about suggesting his own living space to rosestar when he got back. Ugh...it was so wet! Indeed, like any well civilized cat, Spottedpaw was hardly a huge fan of muddying her paws. It was a bit of a given however, when you were born a ShadowClan she-cat, practically raised and fostered within these dirty and leech-infested marshes. A small, frustrated snort escaped her nostrils, her mood only further souring as she followed in her mentor's imprinted pawsteps, wishing more than anything in the world that Blossompaw could be by her side. In truth, Lynxchaser wouldn't have been her first choice as a teacher. He was just so...so...arrogant! Big headed! Pompous! And his oh so fantastic decisions on where to train seemed to end them up neck-high in bog! Okay, maybe she was exaggerating; Spottedpaw was known to do so, especially when she was outside the Camp on her own, with nothing but the handsome tomcat to survey and judge her every move. The thought of his frost blue eyes digging deep beneath her fur, as she practiced stupid and pointless hunting techniques...Spottedpaw had to swallow a whimper of nervousness. No, no, no, she couldn't be afraid now! Despite her initial distaste of Lynxchaser, she had to impress him - in some shape or form, anyhow...But as much as she tried to chase away her rising panic, it snagged onto her heart like a vice; that familiar squeeze, the tightening of her throat, the harsh and ragged breathing ripping like claws at her chest. Spottedpaw squeezed her eyes shut, pointedly fixing her mind on Blossompaw - her sister's infectious cheer, her best friend and closest confidant...Though it didn't rid her rising anxiety, it eased the mounting pain somewhat, and loosened the knot in her belly. They finally arrived at a more firm patch of ground. With a small shudder Spottedpaw shook out her pelt, splatters of mud flying from her tortoiseshell pelt. She hoped that Lynxchaser would catch the full brunt of it - after all, it was he whom had led her out here, this deep into the marsh. "So...what now?" The she-cat threw Lynxchaser an almost mocking glare, though no sooner had she done so, did a frog leap from the depths of the bog. It's rippling croak startled the already rather twitchy apprentice, and with a squeal, she stumbled backwards, paws slipping on mud drenched earth, before losing her grip on the hard earth and slipping back into the mud. Its thick sludge dragged down at her legs, and she scrabbled at the stringy bits of grass before her, to no avail. Panic had just begun to stab once again at her chest, when she'd finally managed to haul herself from the marsh. At once she sucked in a deep breath, bog soaked fur reeking now of crowfood and frog droppings. As if she'd be allowed in the apprentice's den at all tonight! "T-This is s-stupid," Spottedpaw chattered, her patience finally wearing thin; "w-why here, of all p-places? I...I wanna go home!" alright, this was getting ridiculous. mud was lodged deep in the spaces between his toes, under his claws, splattering on the hairs of his underside. lynxchaser really needed to have a good talking to with rosestar about moving the clan elsewhere. that barn looks like it could be a good new territory. those big, lumbering, smelly whatever-they-ares would surely fend off any unwanted strangers. and i heard loners found a lot of food there. just.. any place but here! behind him, stumbling and perhaps in an equally—if not more than—sour mood than he, followed his apprentice. lynxchaser didn’t bother looking back. by the sounds of it, she was having as much fun as he was. none. it did concern him the slightest that spottedpaw, a she-cat not known quite so talkative as her sister but did not entirely lack the ability to speak up (she certainly liked to complain about lynxchaser’s style of teaching), was eerily quiet save for the same disgusting squelching noises of her paws dragging in the mud. “tangledfoot’s going to make me sleep outside tonight for this, isn’t she?” he despaired, frowning. he couldn’t blame her, or any of the other cats who he shared a den with. he was well aware of the stench of bog permeating the air and jarring him quite rudely awake in the dead of the night. he took one last look at his dirtied pelt before facing spottedpaw. only to get sprayed right in the face with more mud. “the goal of the game is: catch a frog. sounds easy.. actually, it doesn’t even sound easy nor is it truthfully easy a task to accomplish. think you’re up for it? more mud in your ears isn’t so bad, yes?” lynxchaser flashed her a cheerful smile, though the gleam in his eyes screamed sarcasm and the absolute want—nay, need—to join the deceased. starclan, having an apprentice was going to kill him someday. and look at him, swearing to the ancestors and shaking a paw at the sky. he wasn’t even religious! Spottedpaw hated the feeling of the bog sticking between her paws, of the mud squelching deep between her toes and the dirt caked thick in her tortoiseshell fur. It was at that moment that a frog sped past, its mold freckled skin a slimy streak of green against the tussled strings of grass and sludge. Its web feet took him to a hollowed out cusp within the ground, swollen with mucky brown rainwater, and with a large hob it disappeared beneath the surface. She hated ShadowClan territory - and yes, okay, maybe she shouldn't say that, being born a ShadowClan cat and all. And maybe, just maybe, she was being slightly overdramatic. Just slightly. But one frustrated glare over at Lynxchaser, in all his obnoxious glory as he leaned back and groomed a paw, was enough to have her kneading the peaty ground in pure, burbling frustration. He wants me to catch that? The small apprentice had never exactly been one for following orders. Rather, her interest extended only to those within her small, familial circle - and with Lynxchaser's pompous attitude, she had no plans to add him within to that 'circle of trust' anytime soon. A feeling of fiery stubbornness welled up like a geyser pooling up deep within her chest. Why should she listen to him, of all cats, prattle on about hunting and orders and whatnot, when he himself looked as if he'd never even broken a nail in his entire life? A snort escaped her nostrils, stirring up tendrils of cool air before her nose. "And what if I say no?" With an angry huff she planted her rump down on the sullen earth, paws practically sewn to the mushy ground beneath. No, she wouldn't be bossed around by such a...a...frog-skinned mentor! Ha! The she-cat's ears twitched back, eyes narrowed to challenging thin slits as she added, rather childishly, "why don't you go catch me a frog? Hrm? I'm feeling rather hungry, and I'm sure you wouldn't mind ruffling up that funny looking fur of yours, yes?" Spottedpaw puffed out her chest, seemingly proud at her sudden open display of defiance. If only Blossompaw could see me now! But as her words sunk in, hanging in a lull high in the heavy, cicada song drenched air, Spottedpaw's confidence began to falter. Soon she glanced away, unable to meet his eyes any longer, though her scowl remained set against her countenance. Nobody, and I mean nobody, bossed her around! Unless that somebody was Blossompaw. Then, yes, all the 'bossing' was allowed. it was no big secret that lynxchaser and spottedpaw’s relationship—professional and otherwise—was rocky. he, personally, didn’t mind at all save for the small frustrations he had when the tortoiseshell was more unresponsive the usual. and really, that wasn’t so bad, either. his patience was something that should be revered; though lynxchaser wouldn’t so much call it patience as it was amusement at his apprentice’s attempts at acts of defiance. he could do this all day! well, assuming that they were in a different setting and there wasn’t any bog water weighing down his pelt. [ PS ] alee omg this is lowkey rly short but here it is!! Dear StarClan, it was a miracle they hadn't killed each other yet. And as Spottedpaw glared daggers at the fanciful tom before her, all sass and no class, she barely founded enough self control to keep her silver talons sheathed. A huff was wrenched hard from her lungs, paws kneaded at the squelching mud below. To obey or not to obey...that is the question. For alas, here a poor maiden lay at the mercy beneath a prince of pelt a diamond white. And in times as traditional as these, would the fair maiden truly emerge victorious? Would the - ? Okay, so formalities and poetry didn't suit Spottedpaw. Screw it. For in the end, the 'fair maiden' merely bowed her head in reluctant submission. Because, no, she would rather not spend the rest of her days known only as Spottedpaw, while her fellow apprentices flowered and bloomed into their full warrior titles. Amber eyes narrowed against the frame of her countenance, a barely audible growl throbbing deep in her maw. A battle had been lost. Lynxchaser was victorious - and Spottedpaw was, once again, at his whim. That didn't stop her from rebelling in her own small, undeniably pathetic way however. As she passed his perch, one eye flickered up to meet his own, and a smirk twinged at her lips. Twirling on her heels so that her tail was raised bare to the tom, she began to backpedal at the mud and dirt, as if she were burying dirt. Yeah! That's what I think of you. Frog-guts. She sprung away quickly, now intent on actually catching a stupid frog so that she could get this all over and done with. Her lip curled back, revealing a set of stained yellow teeth, as a horrible odor touched at her nostrils; peering through a clump of straggling reeds, her vision snagged on the bloodied, half eaten form of a magpie, its wings spread wide and flies alighting on its blank, glassy eyes. Inwardly Spottedpaw blanched. One paw hooked around its middle, and tossed it up towards Lynxchaser, as she gave another sniff of disdain. "Wouldn't want you going hungry now, right?" the she-cat muttered, shooting him another poisonous glare. As quick as a hawk, she dived into the thick of the reeds, certainly not one to brave a full on confrontation with her own mentor. The flies buzzed and swirled as she passed through, forming a thick black cloud as they took to the air high above their swampy hiding place. Well, a fly wouldn't even feed a mouse - so catching one of those wouldn't be good. Again her gaze passed over the bubbling marsh, scanning for even the slightest hint of movement, of something, anything, even remotely alive. That sign came in a rippling 'ribbit.' Spottedpaw's heart jolted within the confines of her chest, and her head swung around the frame of her shoulder; there was a hop, a flash of green as her quarry disappeared behind a thicket. For once she wasted no time in groaning and moping about; paws reacted on sheer instinct, as she kicked back against the earth and leaped after the slimy creature. The apprentice exploded from the reeds in a rush of frenzied pants and chaotic screeching of birds as they took to the air. Another ribbit - just beneath her paws! One claw slammed down before the frog could make a break for safety; she felt her talons pierce sticky flesh, and teeth struck down upon the flailing creature's back, a nip at the spine sealing its inevitable fate. "Ha! See that?" Immediately Spottedpaw looked over for her mentor. "Done in a jiffy," she boasted proudly. "Betcha not even Rosestar could do better!"